British Olympic icons Seb Coe OLY and Mo Farah OLY have been honoured by their peers with a special OLY presentation at a GB Olympians event in London. The two Olympic champions were taking part in the Olympians Mile, part of the famous Westminster Mile that runs through central London and finishes outside Buckingham Palace. 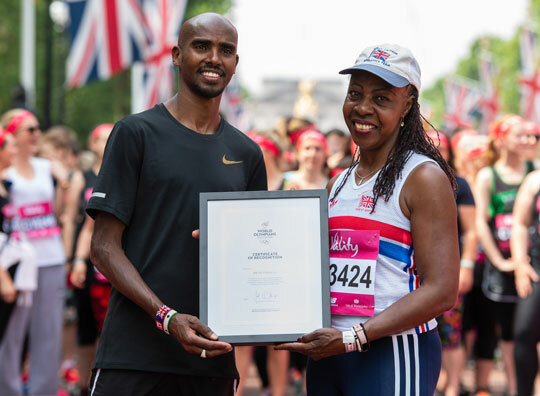 At the conclusion of the race, both Coe and Farah were presented with OLY certificates of recognition and pins by fellow Olympian Joslyn Hoyte-Smith OLY, chair of GB Olympians, the country’s National Olympians Association. Following the Olympians Mile, GB Olympians brought together more than 100 Olympians from a cross-section of sports and Olympiads to celebrate, reunite with old friends and reminisce about past experiences. Coe, President of the IAAF and former head of the London 2012 Olympic Games, who won gold in the 1,500m at the Moscow 1980 and Los Angeles 1984 Olympic Games, and Farah, who claimed gold in the 5,000m and 10,000m at both London 2012 and Rio 2016, acted as ambassadors for the race. Ahead of the event, Farah also visited local schools to encourage kids to get active and take up sport. All Olympians who attended were invited to register in advance for World Olympians Association’s OLY initiative. Since its launch last year nearly 10,000 Olympians have benefitted from OLY recognition. Just like PhD and other post-nominal designations, OLY letters can be used on official documentation, CVs, business cards, social media and anywhere a name appears. “It was an honour to present OLY certificates of recognition to Seb Coe and Mo Farah, two incredible athletes who have given so much to the Olympic Movement both in Britain and overseas. WOA’s OLY initiative provides a constant public reminder of the years of hard work, dedication and perseverance needed to become an Olympian and to compete on sport’s greatest stage. I would encourage all Olympians to apply for the honour and help carry the Olympic ethos forward, both while competing and in their lives after competitive sport,” said Joslyn Hoyte-Smith, Chair of GB Olympians. You can apply for OLY recognition by registering your details HERE. Get yours today and join a growing community of athletes worldwide who have claimed this unique honour.